Knock on Wood: Leibster Award + Grateful Heart + A Giveaway! Leibster Award + Grateful Heart + A Giveaway! 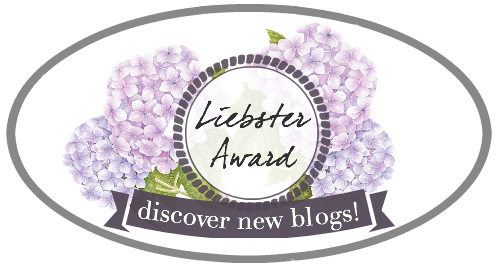 I was nominated last week by my sweet friend Melissa for the Liebster Award. It's an award for small and new bloggers who have really touched and inspired you. But what does "liebster" even mean?? Well, I looked it up. It's a German term of endearment meaning "beloved", "dearest", or "sweetheart." How fitting right? I am so honored and grateful to be nominated and I am excited to be able to nominate some of my favorite bloggers too! But there are rules that go along with this award, so let's get to it! >>> Let the bloggers that you nominate know that they've been nominated! Random Fact #3 - I'm seriously contemplating putting up my Christmas decorations this week. Cue all the eye rolls. I know I know, but I'm really really missing my family, and knowing the chances of Philip and me being able to visit them for Christmas is really really, really, really slim makes me even more sad. So putting up the decor will make me feel better. Random Fact #4 - I have a growing love for Snapchat. And even though I only really send snaps to a few of my girlfriends, I still think it's super fun. Random Fact #5 - I need an app to help me remember things. It's actually pretty awesome though. It's called Wunderlist and I use it for more than just the notifications. Random Fact #6 - The only reason I can tolerate keeping my nails painted on a regular basis now is because of this amazing little bottle of miracle liquid. I got it from Ulta and it's Essence Nail Art Express Dry Drops. AH-MAY-ZING I tell you. Cuts my nail pairing and drying process by like 75%. Seriously. Get some. Random Fact #7 - I am getting over my stage fright thanks to school. Being a Psychology major means lots of papers and the presentations that go a long with those papers. Not to mention my speech class this session. Turns out I'm much braver than I thought. Random Fact #8 - My friend Melissa has only has car trouble when I'm with her. A flat tire? Yep I was there. Dead battery? I was there too. Transmission issues? Well I wasn't actually in the car for that one but I was behind her in my own (Thank God!). Those things are never good, but having a friend there at least makes it a little better, right? Random Fact #9 - I like elephants. I have an elephant table/statue thing in my living room. His name is Homer. I had a stuffed elephant growing up and his name was Ollie. My phone back ground is a purple elephant. I don't know why, but I just like them. Random Fact #10 - I have a tattoo on my wrist. It's the only one I have, and probably the only one I'll ever get (not that I don't want more though). There's a story behind it too, but I'll go into more detail about that later this month though, so be sure to watch for that! Random Face #11 - I play drinking games with my mom and her husband. And it's totally fun! I don't recommend it for everyone though. Ok now for the questions from Melissa. Honestly I was bored. I had just moved to Missouri from Georgia, with no friends or family. Being at home alone all day while Philip was working really began to take a toll on me, so I turned to writing. Luck for me I fell into this lovely place and met so many great people I can now call friends. I do! I totally just listed them ALL out on a post last week! Check that out here. What's one thing you'd have to have with you if you were deserted on an island? Sunscreen. Like... I don't wanna get sunburnt. I love that show Girl Code on MTV. or is it VH1? I can't remember, but it's freaking hilarious. What is your go-to accessory staple? A scarf. I can rock an infinity scarf with almost any outfit! What is the best thing you've ever cooked? Chicken Bacon Wraps for sure. Hubs loves them! Recipe here. If you were one of the four seasons- which would you be and why? Winter. I love the snow and prefer colder weather. Plus winter can be so beautiful and all the best Holidays are in Winter! Were you born in the state (or country) you're currently living in? If not - what brought you there? I was born in Georgia, but I moved to Missouri last September for a man. And now that man is my husband. Sometimes the risks you take pay off in amazing ways. I am a full time student and blogger right now. Once I'm done with school, I plan on becoming a licensed Marriage Tharapist. What do you think MSDS stands for? 2. What's your most favorite post you've ever written? 3. What's the story behind the name of your blog? 4. Name three places you think everyone should visit if they get the chance. 5. What is your go-to recipe/meal for dinner? 6. Do you like where you live? If no, where do you want to live? 7. How many children do you have/want? Why? 8. What movie could you watch every day without getting tired of it? 9. Cats or Dogs? Why? 10. What are the top 5 songs on your playlist right now? 11. How many selfies have you taken in the past 5 days? Be honest now. OK!! Now for even MORE fun! How's that possible you ask? We'll It's Becca Dorr's birthday! And in celebration she, and a bunch of us other lovely ladies, are having a giveaway!! There will be TWO winners! One winner will get a $250 gift card to either Sephora, Target, or PayPal cash (your choice!) and the second winner will get an Urban Decay Vice 3 Palette! I mean who doesn't want one of those?? Check out the Rafflecopter below to find out how to get an many entries as possible! Grateful Hea - Oh, LOOK! A shiny!